My pal Ger Apeldoorn scans in a 1946 Dik Browne profile from the Ford Times magazine. 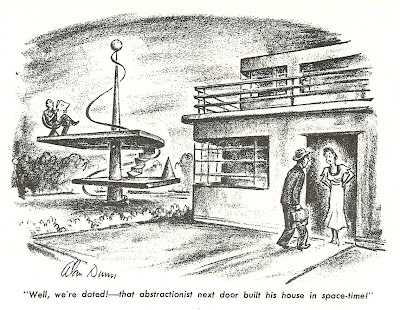 This, Ger assures us, kicks off a week of Dik Browne posts at his The Fabuleous Fifties blog. 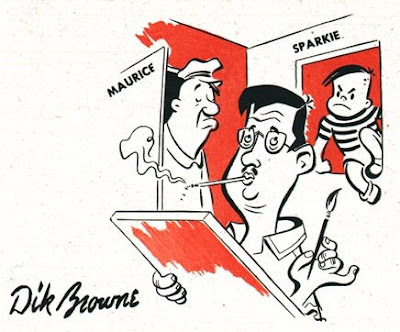 "Maurice, a moody mechanic" and "Sparky, a precocious problem child" were two characters that Dik created for The Ford Times, a Ford Motors employee publication with a circulation of 120,000. Please note Ger's comment below. I jumped the gun on this somewhat. 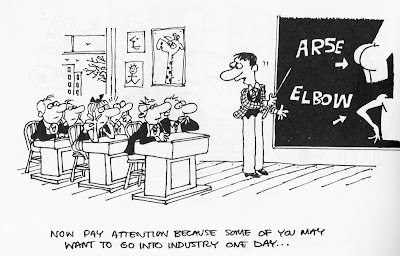 Regardless, the Dik Browne week is on, all week long, at his blog. And have a wonderful honeymoon, Ger! Here is a good documentary on the renowned Canadian editorial cartoonist for the Montreal Gazette. 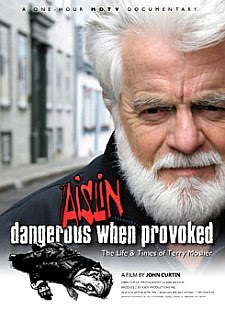 AISLIN: DANGEROUS WHEN PROVOKED - THE LIFE AND TIMES OF TERRY MOSHER (2006) is a 43 minute film directed by John Curtin. It won the Gemini Award for best biography documentary. This Gemini Award-Winning "Best Biography Documentary Program" focuses on Terry Mosher, aka Aislin, often called the nastiest political cartoonist. At the edge of his pen, no one gets out alive. The film reveals little known aspects of Mosher's life, from his early days in Ottawa, to his adventurous ramblings, hitchhiking across North America as a young man, looking for something interesting to do with his life. He finally decides on art school, leading to a job with The Montreal Star as a cartoonist, and then with The Gazette. The rest is history. 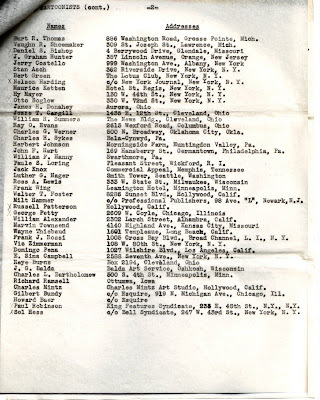 This is one part of a package of contact information of other cartoonists circa 1941, along with lists of places that employ artists. It was in business envelope postmarked Mar 24, 1941 from "Art Headquarters" to a Mr. Paul K. Turbeck with its complete contents. Above: BUZ SAWYER detail from a January 22, 1941 original at the Three Men in a Tub blog. Ted Dawson loves Roy Crane at the Three Men in a Tub blog, and queries about more Roy Crane in print. Hervé St-Louis writing for the Comic Book Bin has some good news. Blogger's Block? 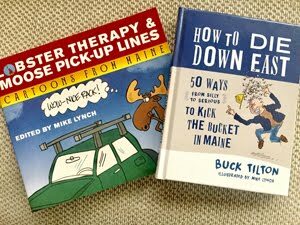 Try Blogging Like a Cartoonist! Blogger's Block? 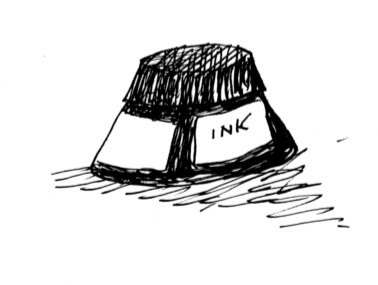 Mark Anderson suggests, "Maybe you should try to blog like a cartoonist!" OK, this is a lot of fun, and, although it's framed as something silly, Mark lets us all in on some very real gag writing techniques that cartoonists use to generate a laugh. The video for this posting was taken down in October, but Dave Coverly himself found a YouTube clip of this fun concert. Do consider taking a look if you have 4 minutes and 24 seconds! From October 10, 2009: Here is a 4 minute video of my pal, Reuben Award winner and SPEEDBUMP cartoonist Dave Coverly drawing LIVE, on stage, with the Kalamazoo Concert Band as backup. LISTEN: the band is playing "Powerhouse" composed by Raymond Scott. You'll know the music as soon as you hear it, especially if you love animated cartoons. LOOK at Dave's GIANT hand, hovering over the stage, drawing BIG BIG BIG - unaided by special effects or, so far as I can tell, pencil layouts! He's on the drawing high wire with no net! Go Dave, go! This is part of the "Clowning Around with the KCB and Speed Bump's Dave Coverly" concert, conducted by Dr. Thomas G. Evans. It was recorded, mastered and mixed by John Stites. My thanks to Dave for coming up with the video for this. And a repeat of the original hat tip to Mark Anderson for the heads up! From the Chicago Humanities Festival on November 7, 2009: New Yorker cartoonist and Cartoon Editor Bob Mankoff talks about laughter and cartoons with fellow cartoonists Pat Byrnes, Roz Chast, and Ed Koren. This runs about an hour and 15 minutes. Here is some video from Cuba. Jeannie Schulz organized a trip there earlier this month. A group of cartoonists representing the Charles M. Schulz Museum visited the island nation. In this 30 second video, we see MAD Magazine's Tom Richmond caricaturing another caricaturist from the Cuban weekly humor magazine, Palante! They only need 30 seconds because they are both fast on the draw. 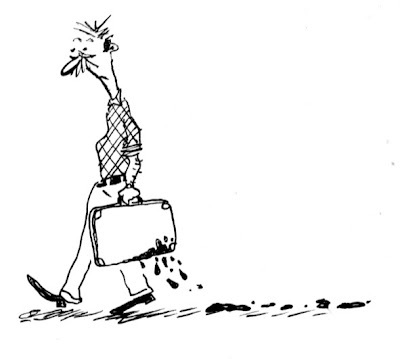 Related: Tom Richmond's Cartooning Adventures in Cuba. Via the Retro Renovation blog, here are a series of Steinberg wallpaper samples -- the 1946 Paris design (above) or five other wallpapers and fabrics -- if you would like to have Steinberg wallpaper in your home. Yes, the we're talking the real paper wallpaper on a real wall; not talking your screen wallpaper made outta pixels. Some people say that cartooning is a calling. The people who do it just do it because they want to -- more than anything else. 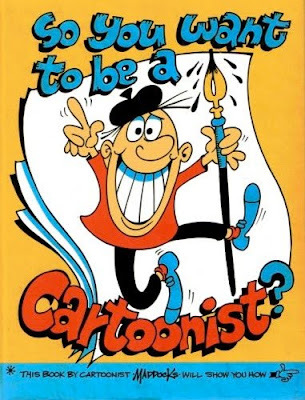 The cover to SO YOU WANT TO BE A CARTOONIST by Peter Maddocks, New York: Simon and Schuster, 1982. 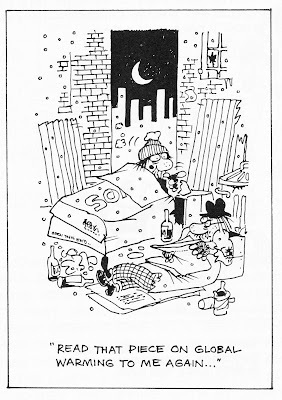 British cartoonist Peter Maddocks is of the most prolific cartoonists of the 20th century. He was a very busy man, whose cartoons graced all of the major publications. By his own admission, he took cartoons seriously. Yes, one can take those funny little pictures very seriously. Maybe too seriously! There is a special place in heaven for those patient souls who choose to love and live with cartoonists! 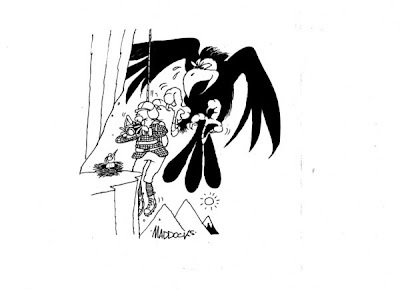 Here is a small collection of some of Mr. Maddocks' incredible output, with emphasis on his gag cartooning. The thing about Peter Maddocks is that he makes it look easy. Above are 2 bums, in an alley. There's a night sky, so we know when it is. Peter has drawn an alley, so we know where it is. But that's not all. Look at the little touches: the clutter that he lovingly draws, the choice of having the second hobo cross his legs as he is settling down to the paper, the last remaining bottle of cheap hooch by his elbow. This all looks effortless - but those little touches are by choice and add to the value and character of the drawing. They are extra work. Those little touches take thought and consideration and that's what places Peter above the run-of-the-mill cartoonist. 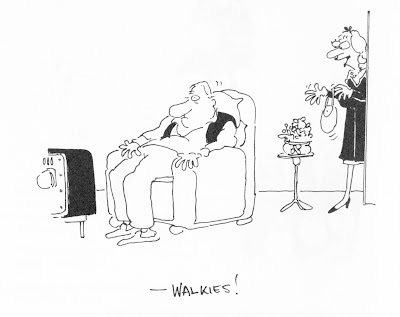 If you are of a certain age, you grew up with Peter Maddocks' cartoons in the Daily Sketch or the Daily Express. Peter obviously loves to draw, which is one of the reasons I wanted to highlight him. Here, in the classroom scene, where he could have gotten away with drawing just a few students, he's committed a good half dozen to the picture, plus their desks. And I am leaving out a lot of other good things (like that fact he started up his own successful agency at the age of 21 fresh out of the Merchant Navy, his long association with Mayfair Magazine, his taking over Useless Eustace from Jack Greenall, and more). Above: one of my personal favorites. I remember laughing out loud (I really mean it -- not just "LOL," but really laughing out loud at this one). I love new takes on classic gag cartoon situations and Peter delivers here. 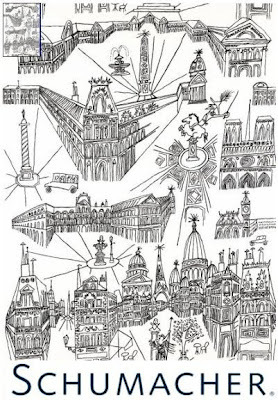 Maddocks is a cartoonist with a pen line that is fun to look at. 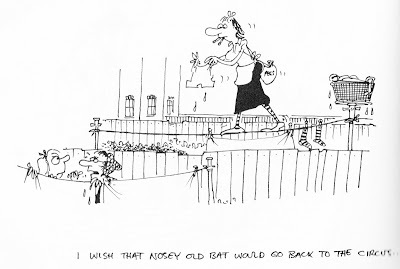 "I was a huge fan of the Goons on the radio and I suggested it would make a great cartoon for the [Daily] Sketch–Julian Phipps became very interested and contacted Spike Milligan about giving permission and writing a script. I went to The Goon Show rehearsals and met Harry Secombe and Peter Sellers. Sellers was very enthusiastic and we sat together drawing some of the characters, like Bludnock and Morriarty. I drew up some strips to show the famous three, all was going well until the Daily Star and Spike couldn’t agree on a contract, I never did find out what happened but the idea fell through." So far as I can tell, this interview is not online. 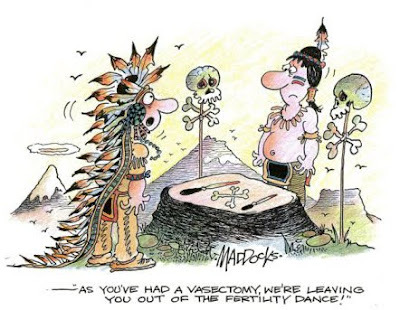 Another good Native American gag, and an example of bringing in an incongruous modern take on an old tradition. Mr. Maddocks has retired to Spain, where he now paints in acrylics. My thanks to Leif Peng and Bryn Havord for their invaluable assistance. Images © 2010 by Peter Maddocks. All rights reserved. Here is Bob Staake's "How I do a Spread." Above is, as you can see, is his rough for WE PLANTED A TREE by Diane Muldrow, which is coming from Random House this spring. You can also appreciate how much actual, physical pencil-on-paper drawing goes into the heart of the rough before Bob works his PhotoShop magic. 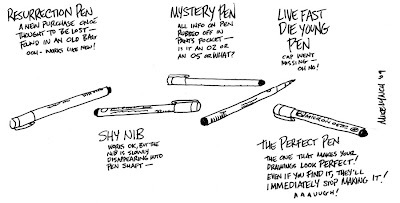 I love learning the working methods of illustrators of Bob's caliber. And I'm grateful that from time to time he will share some of his behind-the-scenes process. LESS THAN 2 WEEKS BEFORE DEADLINE! ALL SUBMISSIONS TO BE PRINTED AND MAILED. NO EMAIL SUBMISSIONS PLEASE. The National Cartoonists Society invites cartoonists -- members and non members -- to submit their published work for award consideration. The big news is the addition of a new award category, specifically honoring graphic novels. All of the rules are below, as are links to the 2 forms needed for each entry. I'm the Awards Coordinator this year and I'm glad to answer any questions or concerns. 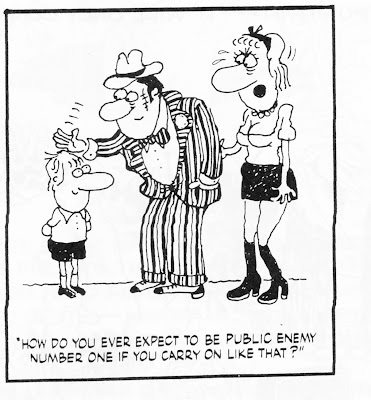 It's time to prepare your entry for the National Cartoonists Society Division Awards. Below, you will see the list of the juries which will judge the categories, the jury chair and the address to which you will send your entry. Please remember only recent work can be considered. This means work published between the dates of December 1, 2008 and December 31, 2009. Please submit published tear sheets when possible and document when and where the work was published. 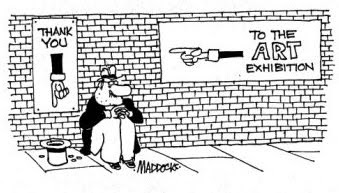 Members of the National Cartoonists Society and nonmembers may submit. 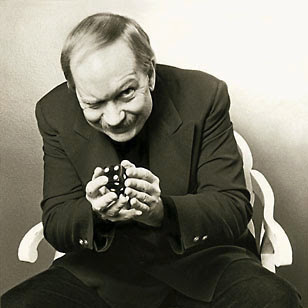 The winners will be announced at the 64th Annual Reuben Awards Dinner on May 29, 2010. Once again: Each entry must be accompanied by a completed ENTRY FORM and a BIO SHEET. The submission deadline is February 6, 2010. It's here at the Sound of Young America. Hat tip to Michael Maslin. Photo nicked from the Rebels of Mars site. 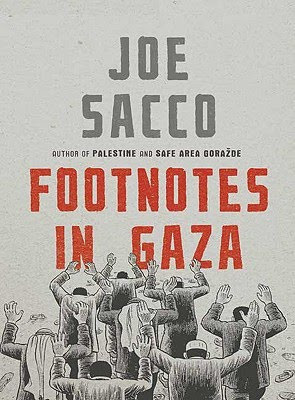 Popular cartoonist-journalist Joe Sacco stopped by WNYC’s The Leonard Lopate Show this afternoon to discuss his new book Footnotes in Gaza. You can hear the full interview by clicking this link, http://audio.wnyc.org/lopate/lopate012010cpod.mp3, and view two pages from Footnotes in Gaza by visiting http://www.wnyc.org/shows/lopate/episodes/2010/01/20/segments/14850. For your adult nerdly pleasure via Geekologie. Tip o' the hat to Andertoons! I was nodding with agreement as I read Julie Larson's (THE DINETTE SET) analysis of the newspaper comics industry ("No Laughing Matter," by Steve Tartar for today's Peoria Journal Star). 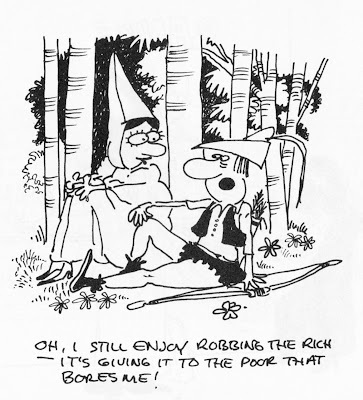 "Cartoons are directly tied to the fate of the newspaper, Larson said. When the Seattle Post-Intelligencier dropped its print edition last year to produce an online-only publication, Larson saw her compensation drop from $375 for four Sunday strips to $40. "Larson recently decided to drop her affiliation with Creators Syndicate. Instead, she plans to market 'The Dinette Set' herself." By taking the duties of marketing and networking THE DINETTE SET away from the syndicate, she may save the money that the syndicate was charging, but now there's that new challenge of balancing the business side of the long-running panel with the creative side. Tartar goes on to get a few views of the state of comics today. I'm a big believer that the comics page is like TV: you don't necessarily look at everything. My "stale and recycled" poison is another person's meat. Mike Gioia and roommate Alex Tuller,who create a Web strip APOKALIPS, are featured as part of the "new model" of cartooning, which isn't making them money -- but they still love it. And Mike can afford to love it, he splits the rent with Alex and he works fulltime for a Manhattan office of PricewaterhouseCooper. This is not a "new model" for a working cartoonist, this is cartooning as hobby. "'The Internet is the monster that ate reason, a thief in the night that turned loyalty to a 150-year profession into a homeless shadow of itself,' she said. 'There needs to be a way to compensate cartoonists fairly or there will be no more comics.'" I think Julie's wrong about this. There will always be comics, but more and more of them will be drawn by people like Mike Gioia, who has the fulltime job and the health coverage that allow him the luxury of creating a cartoon for free. Hat tip to Tom Spurgeon for this. Thanks, Tom. 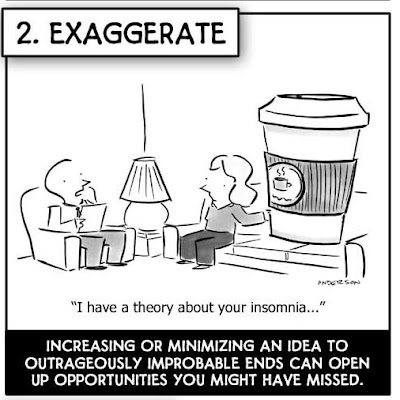 Related: Mike Lynch Cartoons: Monetizing Your Cartoons. I'm trying to clear my shelves. All items start at 99 cents. 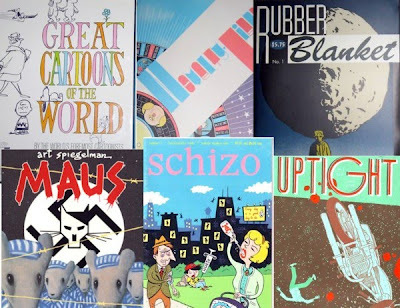 Sale includes: the first 3 GREAT CARTOONS OF THE WORLD books (HC/DJ), Ivan Brunetti's SCHIZO, Chris Ware, David Mazzucchelli's RUBBER BLANKET, Jordan Crane's UPTIGHT, Milt Gross, Kurtzman, MUTT & JEFF and more. You could spend today reading about David Levine, who passed away on the last Thursday of 2009 of prostate cancer. Levine was one of the last -- maybe the last -- illustrators to be linked and branded with a particular publication. He was the graphic artist of the New York Review of Books. His unique, painterly pen style defined the publication as Hirschfeld defined the NY Times Arts & Leisure section, and as Rea Irvin defined the initial New Yorker magazine look. Levine's caricature technique was much admired. 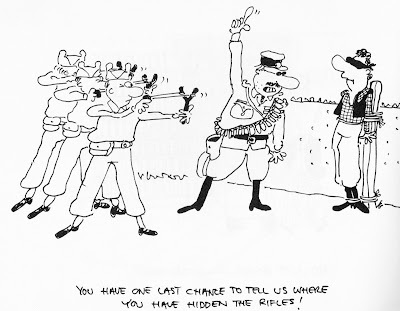 Ed Sorel, writing in Time Magazine, likened it to French cartoonist André Gill. Tom Spurgeon has a wonderful write up on the artist's life here. GROTH: I think there’s a cartoonist working now who imitates you. LEVINE: There are a number of them. Each one has something a little different. But basically, the only problem with that is generally, if somebody doesn’t use me but uses them because they’re less expensive, that kind of bothers me. 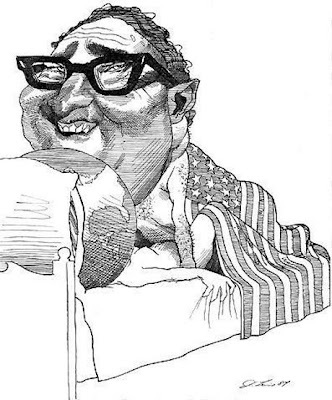 And on one occasion, many years ago, there was a guy who was editor of the Atlantic Monthly, Robert Manning, and he hired somebody who did an entire issue of the magazine, full of caricatures, small drawings, but all of them total imitations. But he didn’t sign them. I have a feeling that was an editorial choice. Because I had done some work for them, I poked a little fun at them by sending the bill, as if I had done it. [Chuckle.] I never got a word back. It was a joke. Other tributes to David Levine include Steven Heller, David Margolick, Steve Bell, Peter Kaplan and Steve Brodner. Thanks to Journalista! and the Comics Reporter for the links. After STAR TREK was cancelled, Gene Roddenberry produced a couple of TV pilot movies in the 1970s, including THE QUESTOR TAPES. None of these were made into series, but QUESTOR came the closest. And now, 34 years to the month after it premiered, QUESTOR is getting a new lease on life: it's being developed as a new TV series. THE QUESTOR TAPES pilot echoed a lot of Gene Roddenberry's favorite ideas: an android trying in a Pinocchio-like way to understand what it is to be human, searching for its creator, and we even touch on a superior benevolent alien race that's attempting "to prevent Earth from destroying itself before it can mature into a peaceful society." Plus the movie has Dean Wormer (John Vernon), acting as bad guy, so it's got that going for it. Not to mention the ever-so-likable pre-M*A*S*H Mike Farrell and the commanding presence of Robert Foxworth as Questor. The series, if it had been made, would have been a buddy show, with Mike Farrell helping Foxworth become a bit less of a fish out of water as they had a series of adventures. Trekmovie has all the information on the new reboot, including the two video sequences below: the original gambling scene from QUESTOR and a similar sequence for data from a TNG episode. Richard Colla, the director, is quoted in Retrovision Magazine's fond and thorough overview of the pilot titled "Gene Roddenberry's The Questor Tapes: The Unfulfilled Promise:"
Here is a video profile from the Pittsburgh Post Gazette of graphic novelist Ed Piskor. 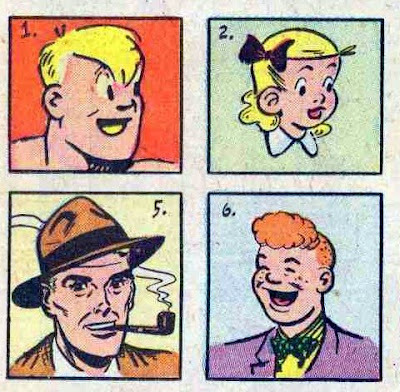 Pappy's Golden Age Comics Blogzine showcases a couple of fat kids comics: CHUB and LITTLE LOTTA. Go see the entire graphic at Sam Henderson's The Magic Whistle Blog. Hat tip to Mark Anderson! Thanks, Mark! From the Finnish newspaper Ilta-Sanomat comes this commercial about newspapers and the Web, working together. It's about a minute and it's worth a look. Bit hat tip to my friend Sean Kelly! 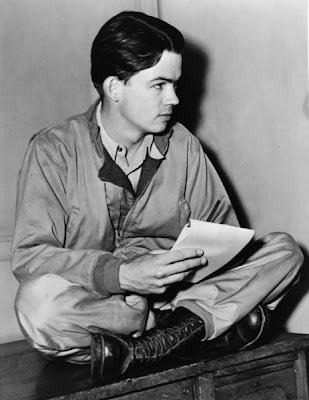 Photo of Bill Mauldin by Fred Palumbo, Library of Congress. "Ever wonder about the military careers of famous people such as politicians Spiro Agnew, Ronald Reagan or George Wallace? Or maybe NASA astronaut Neil Armstrong, cowboy movie hero Gene Autry or cartoonist Charles Schulz, to name a few? 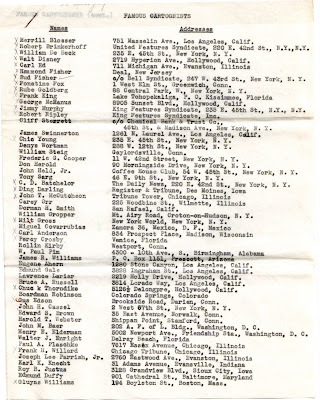 "The National Personnel Records Center has released a list of some 3,000 prominent former military service men and women whose service records may now be obtained under the Freedom of Information Act"
There are a lot of cartoonists who may be on that list. Mort Walker (who doodled the "Kilroy Was Here" sketch above), for instance, who would become head of security for Ordnance Base #1 in Naples, overseeing 10,000 German POWs. "So here I was, a teenage kid with no training and no one supervising me, I was dumped into these jobs. I stopped things like those that happened in Iraqi prison camps from happening. I found people beating up on people and I said, 'Stop that now, I m not going to have any of that.' They would beat up on someone and say, 'Hey, Lieutenant, it’s your turn,' and I would say, 'Stop this now, this is not the way I want to run the place.' There was no instruction, no one told me that. The tendency of a lot of people is to use power when they have it and it isn’t pretty. I feel very lucky I didn’t have to see the horrible side of war." More at the online edition of The Stamford Historical Society Presents Pride and Patriotism: Stamford’s Role in World War II. 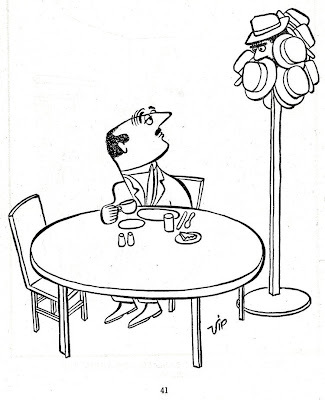 The Hairy Green Eyeball blog shares more Virgil "VIP" Partch gag cartoons from the 1944 collection WATER ON THE BRAIN. Ted Dawson, over at the Three Men in a Tub blog, shows us a rare promotional sales brochure for ANNIE'S LI'L ORPHANS, by Stan Drake and Bill Yates. ANNIE'S LI'L ORPHANS combined Drake's Good Girl Art with Yates'-drawn little cartoon kids (as Ted points out, just like LIBERTY MEADOWS by Frank Cho did years later). Judging by the look of the aged, yellowing Zip-a-tone, this looks like at least a 30-40 year old syndicated comic strip proposal. 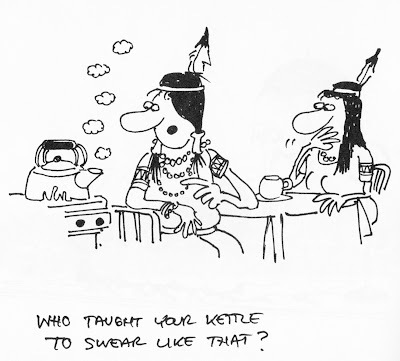 The I'm Learning to Share blog shares some Alan Dunn gag cartoons. Dunn, born in Belmar, NJ on August 11, 1900, was a prolific New Yorker contributor whose illustrative cartoons were a mainstay in the magazine from 1926 until a year after his death, in 1976. 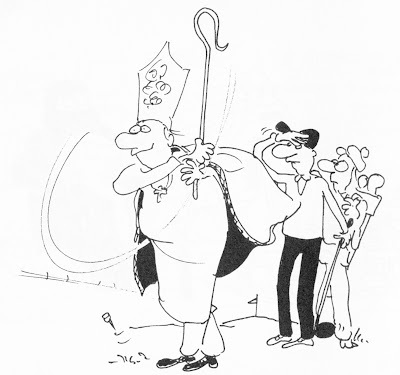 He may have contributed the most cartoon drawings (1,906) of any cartoonist. He was married to fellow cartoonist Mary Petty. Some valuable tips on how and why Richard Thompson uses watercolor. 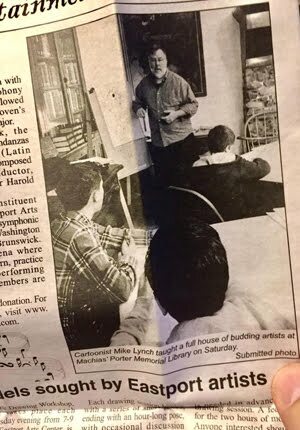 A friend of mine who is a wonderful illustrator, as well as a New Yorker cartoonist, is giving a presentation about his career this morning at his son's elementary school. The gig came with one caveat from the child, "Dad, you gotta draw Spongebob!" Traveling? I don't envy you. 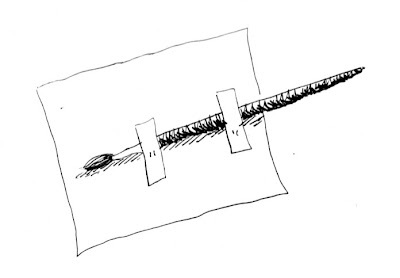 But if you have to travel, and you are dedicated old school cartoonist who loves the old school drawing tools, then you already have a method for safely transporting your beloved art supplies through the rigors of the TSA, the baggage handlers, airplane pressure, etc. ... in a protective matchbox. When the TSA employee asks, Do you have anything that could be considered a weapon? -- Well, I have do not believe that nibs could be used as a weapon. At least, not a very effective one. Regardless, nibs get checked thru baggage. Along with the holder. A good brush is like your pal. Like a pen nib, it needs to be broken in and then it can last (with the proper care) for a long time. The problem is how do you protect your brush shape? I just get a card (an index card, or piece of cardboard) and tape the brush down. And then I take another card and tape it on top, creating, for all intents and purposes, a snug brush sandwich. Confession: I usually use those Pigma permanent ink pens. Below is a drawing from last year depicting "the pens on my desk:"
Related: Some sketchbook drawings and a few more of my sketches. Also related: Do you have too many sketchbooks? 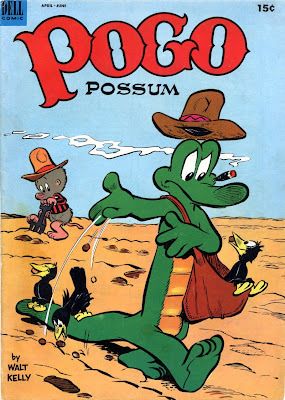 Here are two stories from Pogo Possum #12, April-June 1953 by Walt Kelly via the Big Blog of Kids' Comics. 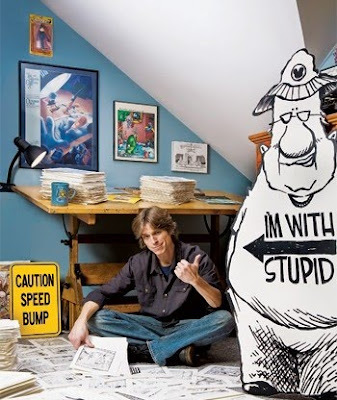 The annual Jay Kennedy Scholarship, in memory of the late King Features editor, was funded by an initial $100,000 grant from the Hearst Foundation/King Features Syndicate and additional generous donations from Jerry Scott, Jim Borgman, Patrick McDonnell and many other prominent cartoonists. 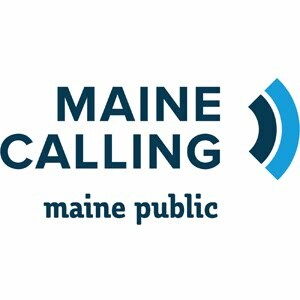 Submissions are adjudicated by a panel of top cartoonists and an award is given to the best college cartoonist. The recipient is feted at the annual NCS Reuben Awards Convention attended by many of the world’s leading cartoonists. Applicants must be college students in the United States, Canada or Mexico that will be in their Junior or Senior year of college during the 2010-2011 academic year. Applicants do not have to be art majors to be eligible for this scholarship. 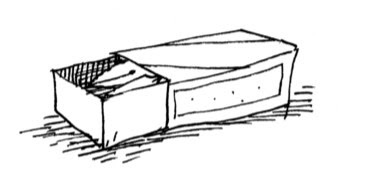 Along with a completed entry form, applicants are required to send 8 samples of their own cartooning artwork (copies only); noting if and where the work has been published, either in print or on the web. (See application for details.) DO NOT send original artwork.